In Light of Jeremiah Wright’s Comments UTT Asks: Was Jesus a Muslim? Saturday at the Nation of Islam event titled “Justice or Else!” President Obama’s pastor Jeremiah Wright stated Jesus was a “Palestinian.” This is historically untrue, but it opens up a door for a deeper discussion. In light of a nationwide push by Muslim Brotherhood organizations to propagate the message that Jesus of Nazareth was a Muslim, it is time to bring some much needed light onto this subject. This billboard, and many like it, are funded and sponsored by groups such as ICNA (Islamic Circle of North America) which is a leading jihadi organization in North America and a driving force in Interfaith Outreach here. Since Islamic jihadis attacked the United States on 9/11/2001, the U.S. Muslim Brotherhood has led a large-scale information operation (“propaganda campaign” if you prefer) to convince Americans – especially religious leaders – Islam is a one degree off from Christianity and Judaism. Almost the same really. 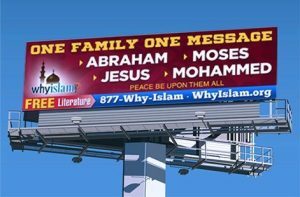 We are told by leading Muslim scholars in America (who just happen to be members of the Muslim Brotherhood), there is “One God” and “Three Abrahamic Faiths” – Christianity, Judaism, and Islam. We are also told “Muslims respect Jesus too.” The first is a lie according to Islamic doctrine. The second is true if you understand Islam through the lens of Islam. Islam defines itself as a “complete way of life governed by Sharia (Islamic Law).” Sharia comes from the Quran and the Sunnah (the way of the Prophet Mohammad). The Quran can only be understood if “Abrogation” is understood. The Quranic concept of Abrogation comes from Quaran 16:101 and 2:106, and is understood by all Sunni Islamic scholars to mean that whatever comes chronologically last in the Quran overrules what comes before it. It should be noted that all Islamic scholars agree Sura (Chapter) 9 of the Quran is the last (chronologically) to discuss Jihad, and Sura 5 is the last to discuss relations between Muslims and non-Muslims. In Islam, Mohammad is considered the al Insan al Kamil – the perfect example for all Muslims to follow. His sayings, actions, and example are codified in authoritative Hadith and in the Sira (biographies of Mohammad). The most authoritative Hadith scholar is Bukhari. This is critical to understanding Islam and how Muslims relate to the world. The reason it is okay for a 60 year old Lebanese Muslim man to marry an 8 year old girl, is because Mohammad married a 6 year old and consummated the relationship when she was only 9. The reason Muslims wage war on non-Muslims until Islam rules the world is because Allah commanded it (9:5 et al), Mohammad repeated this command as related by Bukhari, and then Mohammad waged war on non-Muslims and made them convert, submit, or die. This is why there is no disagreement among the scholars on these matters. One God, Three Abrahamic Faiths? So let us go back to the question: Can Allah be the same God of the Christians and Jews? Can the same God who calls the Jews his chosen people (Deuteronomy 7:6-8 for example) be the same God who calls for a holocaust of the Jews? “The Prophet said, ‘The hour of judgment will not come until the Muslims fight the Jews and kill them. It will not come until the Jew hides behind rocks and trees. It will not come until the rocks or the trees say, ‘O Muslim! O servant of God! There is a Jew behind me. Come and kill him.’ (Al-Bukhari: 103/6, number 2926). Allah will “punish” non-Muslims through the hands of the Muslims. This verse (9:14) creates a requirement for Muslims to punish non-Muslims. As seen through the eyes of Islam, Abraham, Moses, Jesus, and others are Muslim prophets. How can that be? We must first begin by understanding Islam teaches that no authentic Torahs, Old Testaments, or New Testaments exist on the planet today. Islam teaches the Quran has existed for all time in Paradise. When the authentic Law of Moses was given to the Jewish people, those who did not follow it were lost (condemned). When Jesus brought the Gospel, those who did not follow it were lost. When Mohammad came with the “final” revelations as the “seal” of the prophets, those who did not follow Islam were lost. Islam teaches that corrupt Jews and Christian priests changed the original Old and New Testaments which, according to Islam, predicted the coming of Mohammed. Historical accounts, biblical manuscripts, the Dead Sea Scrolls, archeology, and other tangible sources of evidence be damned. This is what Islam teaches. No one comes to our Father in heaven except through Jesus OR will Jesus return to cast all Christians into hell for not converting and kill the Jews (pigs)? It cannot be both. Jesus was either the Messiah and the Son of God who was crucified, died, resurrected and ascended as Christians teach and believe or he is merely a prophet as Islam believes. It is one or the other. He cannot simply be a “nice” guy. Jesus himself claimed to be the Son of God and the Son of Man. If that is not true he was a liar. This is not a theological debate. This is a discussion of logic and reason. These two worlds are completely incompatible with one another in the realm of Logic 101. Christians believe God is the Father, the Son Jesus, and the Holy Spirit. One God, three persons in a heroic fellowship into which mankind was invited to participate relationally. God promises his inheritance and his Kingdom to his children whom he loves because he created them in his image. Jesus gave all who believe in him all the authority his Father in heaven gave him to continue his work (John 14:12, Mark 16:17-18), and lifted all believers, spiritually, to sit with him at the Father’s right hand in heaven when he ascended. Islam teaches Allah is the ultimate lawgiver and humans must obey the law or suffer punishment. Islam teaches those who do not follow the Sharia are Apostates or unbelievers and must be converted, subjugated, or killed. Islam teaches Allah is unknowable. From a rational, reasonable, and logical perspective, there is a difference here between love and hate – good and evil. Islam is not a one-off of Christianity. It sits in direct opposition to it. Almost everything we hear from Islam’s civil rights activists and doctrinal experts is deception and disinformation. I know it sounds overly simplified, but as far as I can tell Islam is the platform from which Satan has decided to launch his greatest campaign ever. (You don’t have to believe in any religion to know this is EVIL – many secular people do) And the politically correct minions and islam – apologists have allowed this evil to thrive by going along w/ it.